Everything you wanted to know but were maybe too afraid to ask. beCamp is like any of the best conferences you've attended. Multiple sessions at a time take place throughout the day, with a generous lunch break. The topics are relevant, current, and thought-out, whether presentations or round-table discussions. The differences? It's local to Charlottesville, it's free to attendees--including refreshments and meals--thanks to sponsors, and the entire agenda was created the night before by conference attendees. Be sure to attend both Friday and Saturday to get the most out of the event. beCamp is very unique as an implementation of a barcamp—like any good barcamp is—since it has experienced retrospective, iteration, and many organizers over the years. You! Anyone interested in technology, including but not limited to: software developers, system administrators, quality-assurers, devopsers, designers, and business developers. beCamp 2018 begins Friday, September 28th; doors open at 5pm, with dinner around 6:30pm and the program beginning around 7:30pm. beCamp 2018 continues Saturday, September 29th; doors open at 9am for breakfast, with sessions beginning at 10am. Where is beCamp 2018 being held? beCamp will be held in and around Davis Commons, which is inside Rice Hall @ UVA on the first floor (head toward the back of the building). 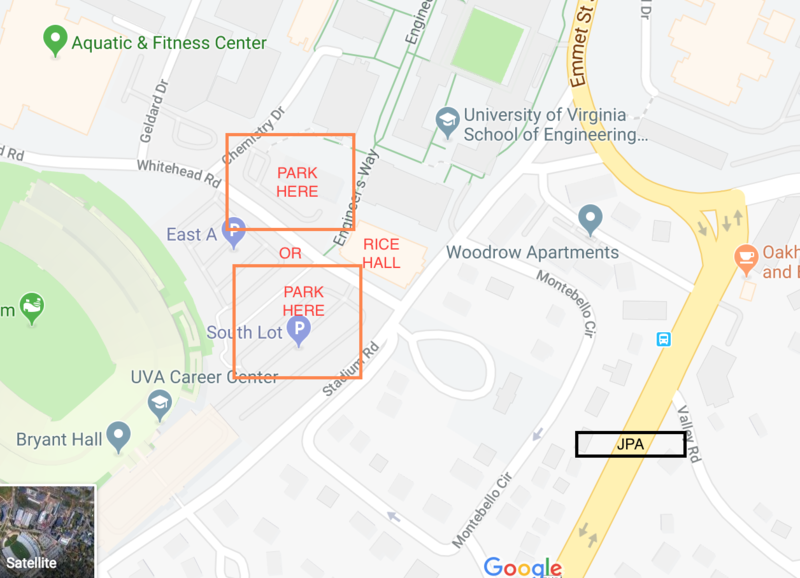 Parking in the lot directly in front of Rice Hall and in the South Lot across Whitehead road is free and no permit is required after 5pm on Friday and (all day) on Saturday. Yes, Virginia, there is not a UVa home football game that Saturday. How much does beCamp cost? beCamp is free for attendees thanks to our awesome sponsors. Food and beverages will be provided for the duration of the event. beCamp draws people together from many backgrounds and experiences to learn and teach about technology. While you are at beCamp, help foster a friendly environment. At beCamp, we do not tolerate offensive comments about gender, age, sexual orientation, disability, physical appearance, race, or religion, or any inappropriate physical contact. We have a full code of conduct. If a participant engages in harassing behavior, beCamp volunteers may take any action they deem appropriate, including warning the offender or expulsion from beCamp. Any participant who has a concern should bring it immediately to the beCamp organizer. We will accommodate any preference or need in support of an attendee's full participation in beCamp. Read the full code of conduct here. Why is the schedule TBD? The schedule will be made Friday night by attendees. On Friday evening, anyone in attendance can suggest topics for sessions held the following day. The suggester indicates whether it is a topic they'd like to present on, hold a group discussion on, or learn more about. After all the suggestions have been written down, they are placed on a wall and attendees mark the topics they are interested in. The suggestions that have the most votes are chosen as part of the conference schedule for the following day. What about topics that are not chosen? Topics that are not chosen for the main scheduling blocks can still be presented as a five minute "Lightning Talk" where presenters can share their message with the other conference attendees. This Lightning Talk portion is held Saturday around lunch time, and may include talks that were not pitched on Friday night. Yes, insofar as presentations and demos go. Most of the time, people are not looking at laptops/phones but talking with each other. Friday night especially is the “less tech” day. At beCamp, we are committed to a safe, inclusive, and accessible environment. We foster a friendly environment with a code of conduct. See the rules here. We will accommodate any preference or need in support of an attendee's full participation in beCamp. This can mean anything: ADA specifics, meeting you at the door with a "beCamp Buddy," or a personal request. Simply contact the beCamp organizers. How did beCamp get started? The first beCamp was held in June 2007 when organizer Steve Stedman decided to hold a "summer camp for geeks." (UVA Today Article) Read more beCamp history. How can I help out with beCamp? If you would like to help out, please Contact Us. beCamp, beSwarm, ...? What's the difference? First, there was beCamp. It's a unique and "very Charlottesville" annual experience. But a year is a long time for a vibrant tech community. beSwarm spunoff in 2010 as a complement to beCamp. beCamp happens in the fall; beSwarm happens in the spring. beCamp is a Friday/Saturday event; beSwarm is a Saturday-only event. beCamp puts together a schedule with attendee-organized topics; beSwarm has no topic schedule. beCamp and beSwarm are un-conferences. Want that beCamp feeling all year? Join the conversation in the #becamp channel on Cville Slack!